Each day we have two sessions working with the sheep and lambs. 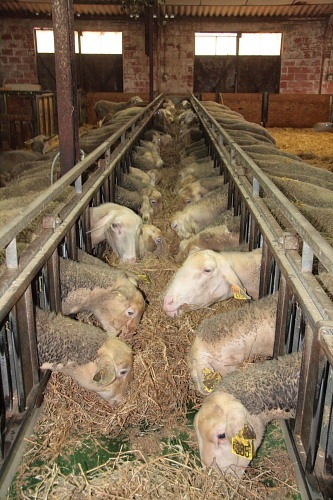 After checking for and dealing with new additions to the flock, the unvarying part of each shift is the feeding. I say unvarying but, just as I thought I was getting the hang of it, the rules seemed to change. Nonetheless, whatever the recipe dictated by the professionals, Luc and Nadine, twice a day we feed the Ewes and lambs. 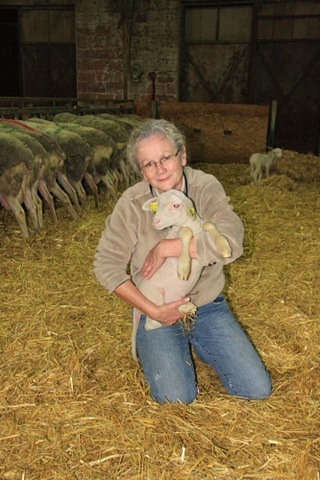 While Luc and I are feeding the ewes, Nadine and Carol feed the lambs. The culinary delight aimed at the lambs seems a little odd, to me, at least. It is a mixture, varying in proportion according to age, of pellets and clay. It’s the clay I’m having trouble with. Clay sounds a bit odd but it clearly works so, so be it. The youngest lambs and those with special needs receive individual attention. This can be because a mother is not producing enough milk or is not giving enough care and attention to her offspring. Somehow, probably by black magic, Luc and Nadine seem to keep track of this and take special care of individuals. A pretty neat trick with 300 lambs. The care often involves subduing a ewe by pressure on her back, allowing another lamb to suckle while she herself is feeding. (In case you were wondering, that’s what Carol is doing far left.) Today, one lamb even got bottle fed with milk from another ewe. After our morning shift, Luc asked if we’d like a cassoulet in a local restaurant for lunch. Cassoulet is a regional classic in this part of France and the local restaurant, La Table Cathar, seems to specialize in it. A cassoulet is a “significant”, belly-building meal of regal proportions consisting of haricot beans cooked together with various meats, in this case confit de canard (preserved duck), pork and sausage. I make my own cassoulet at home and love it. If the smallest excuse arises to make a cassoulet, I grab it. It is a carnivore’s dream. However, this would be my first experience of the real thing in France. The cassoulet did not disappoint; it was absolutely magnificent. I will have to adjust my own technique now that I know precisely what I am aiming for. It was a wonderful and educational culinary experience. A cassoulet is heavy stuff. Exercise after a cassoulet may just about be possible but it is not recommended. We did manage to get up from the table and stagger out to Luc and Nadine’s car but that was pretty much the limit of what was possible. Luc did drive us to a cartoon/caricature exhibition in nearby Castelnaudary (the home of cassoulet) which we managed to stagger around in a brave attempt to help our food settle but all to no avail. We eventually returned to the farm, still full of cassoulet, to give the sheep their second helping of exactly the same diet. We were still groaning under the weight of our lunch. Fortunately, sheep don’t get bored easily. Neither, it seems, does a mixture of luzerne, straw and barley sit heavily on their stomachs. Once again they went frantic for their barley. Still groaning after shift two with the sheep, our evening meal consisted of a little soup and green salad … and wine, of course.